Of course components of the Internet-of-Things (such as RFID) have been used in retail for many years. But the IoT hype has accelerated the thinking and adoption. Here were some companies riding the IoT wave. Bluvision offers Bluetooth beacons and a cloud-based solution for locating/ proximity-based applications. They started with a successful Indiegogo campaign that sold nearly a million beacons (under the StickNFind brand) aimed at consumer uses. They are seeing success in manufacturing plant applications monitoring temperature and vibration on electric motors to provide predictive warnings before motors fail. 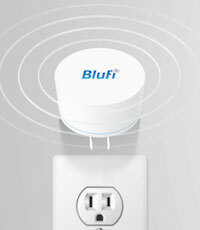 Deployment sounded easy—peel and stick the Bluetooth sensors on each motor and then plug a BluFi device (Bluvision’s Bluetooth to WiFi gateway) into a nearby outlet and pair them. Now Bluvision is also going after retail where there is a lot of interest in understanding how Bluetooth beacons might be used to enhance customer experience (such as providing a store map with “you are here” and directions on their phone), mobile marketing, and customer analytics (where do people go in my store?). 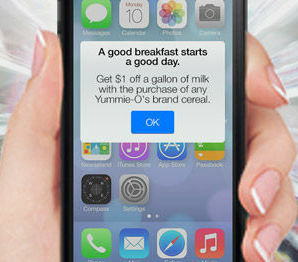 It is very early days for this technology, so there are lots of ideas swirling around and retailers beginning to experiment. Over the next few years, we will get to see which of those ideas gains traction and becomes a winner. I only got to see Cisco for a few minutes, but what I saw was intriguing. Using a combination of in-store feeds, such as video, WiFi, infrared, and others, their system can predict how long each shopper will shop before getting to checkout. In this way, staffing of registers can be increased in time to meet the demand, rather than waiting until the customer experience is bad (i.e. the lines get long) before calling for more associates at the registers. Cisco said they can also use store cameras to check whether inventory levels are low. Cisco offers a broad set of capabilities for retailers beyond those were able to see in our limited time with them at NRF. GPShopper is more than just IoT, but locating technologies play a key role in their overall solution. I talked to GPShopper years ago when they were called Slifter and mentioned them in Location-Based Services Poised for Rapid Growth. The original concept was consumers could ask who had a specific product nearby, and Slifter would look in the inventory management systems and commerce systems of participating retailers with nearby stores and provide a list of locations and prices. Retailers loved the idea of providing this service, but wanted it on their own mobile application. So, GPShopper now provides white label mobile shopping systems with that functionality and more. This includes social and loyalty engagement, giving shoppers ways to share pictures and comments on social media. They also have in-store payment capabilities and can leverage Bluetooth beacons. GPShopper is not an ecommerce system itself, but rather a mobile shopping platform that integrates with ecommerce and many other systems to provide functionality inside and outside of the store. Omni-channel integration has been top of mind for retailers for the past half decade or more. You could ask why it is taking so long. Or you could say, wow we’ve made a lot of progress, considering how complex the challenges are. Here are some suite vendors I talked to tackling these challenges. Some are broader and some are narrower in the scope of what they provide. You can read more about Omni-channel in Ann’s article on NRF. Many retailers started their ecommerce efforts a decade or more ago. For most of them, it was at first an experiment or pilot … let’s try something. As such, they were almost always built as a system on the side, with its own technology platform separate from the mainline systems used by the bricks and mortar stores (i.e. POS, inventory and replenishment, etc.). In many if not most cases, they continued to build on these original platforms, ending up with one set of systems for ecommerce and another for stores. Further, when mobile commerce came out, with requirements quite different from traditional ecommerce, many retailers started using a third system for mobile commerce and maybe even a fourth system for their catalog/call center business. Now that ecommerce has become such a large and rapidly growing share, and mobile commerce is growing even faster, the importance of an integrated approach has reached a critical tipping point. To solve that problem, OneView Commerce offers a commerce platform unifying all those channels. This enables sharing of content across channels, but also the multi-directional sharing of data and trends about what is popular with whom. On this last point, some solution providers have attempted to leverage web data to help stores anticipate demand. OneView also collects data in the store, not just POS data, but other sources whenever available such as video or RFID, to provide insights into what shoppers are doing. This store data can be used by the ecommerce channel, for example to reduce returns rates. JDA, with their numerous acquisitions including Manugistics, i2, and more recently RedPrairie, has amassed industry-leading depth in supply chain software across industries and functions. They have been focusing on integrating these capabilities, such as integration between WMS and TMS, downstream and upstream execution and planning. This includes applying their optimization technology during execution to make better real-time decisions, such as supporting optimal/profitable fulfillment of omni-channel orders. Many retailers are trying to break out of the silo’d approach to omni-channel—the old way with dedicated DCs and systems—to integrate better across channels. JDA is providing tools to do that in a way that optimizes profitability and other objectives. GT Nexus saw strong momentum in retail in 2014, with seven new retail customers. They have been building out their planning and optimization capabilities starting with transportation (they bought Clear Abacus last year). When a company has several TMS and WMS systems, GT Nexus can sit on top getting feeds from them all and doing optimization across the network. The optimization engine runs continuously, so can provide ‘good enough’ answers quickly and then continually improve on the answer. Because GT Nexus has visibility across the whole network, they go across all of the data to provide global rather than local optimization. For omni-channel initiatives, GT Nexus can help answer questions about adjusting inventory flow and locations for optimizing profitability. They provide comprehensive supply chain data, to help their customers’ decision-support systems answer questions such as where is the optimal location to put the product and what is the best way to get it there? NetSuite provides a cloud-based (multi-tenant, single-instance) ERP that includes built-in ecommerce capabilities. Two years ago they acquired Retail Anywhere, adding a cloud-based Point-of-Sale system. 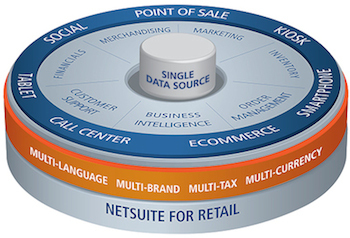 Thus NetSuite has an integrated solution across store and ecommerce. They also have functionality for manufacturers and wholesalers, who increasingly want to sell direct to the end customer, both B2C and B2B. Thus NetSuite’s retail solutions are being more and more used by wholesale distributors and manufacturers as well, with the advantage of one integrated suite for everything from sourcing and procurement, to order management, manufacturing, supply chain management, and the commerce platform. NetSuite also offers a strong set of content management tools with LightCMS acquired in 2013. They continue to invest in that area, which has become critical as rich media is increasingly used across channels (on ecommerce sites, in store, on mobile), as well as shared between the manufacturers and the retailers that sell their products. Quantum Retail’s Q platform provides forecasting, planning, allocation, and replenishment that differs from traditional approaches. To start, products are categorized by the objectives of each category, such as traffic driver vs. core assortment vs. fringe assortment, where the objective for traffic drivers is to drive traffic in the store, even at some cost to profitability if needed, whereas profitability is a primary objective for core assortment. Decisions are made with these objectives in mind. Q calculates the likely profitability of different inventory positions, correcting historical data for things like stockouts. From that foundation they generate forecasts that are dynamic, the platform continuously learning about different behaviors beyond simple seasonality. At the show, Quantum also announced Famous Footwear’s (division of Brown Shoe) deployment of Q, which has helped the retailer better balance inventory across locations, anticipate demand, getting the right style/size mix at each location and thereby improving service levels and conversion. Famous Footwear implemented Q on top of their existing, recently upgraded allocation software. Oracle has a comprehensive retail suite with dozens of applications organized into six categories: Merchandising and Analytics, Planning and Optimization, Supply Chain, Stores and Loss Prevention, Commerce and Marketing. Within these exists a real depth of functionality in areas like merchandising, planning & allocation, trade management, store operations, loss prevention, ecommerce, and much more. Oracle's acquisition of MICROS last year added even more richness to the suite, with a strong point-of-sale (POS) systems capability with a dominant position in restaurants and hospitality. MICROS brings a variety of new and additional capabilities such as Open Commerce Platform (OCP) capability for B2C, B2B, and mobile ecommerce; Locate which is a cross-channel, rules-based, inventory visibility/ order brokering system to allow orders to be fulfilled from anywhere; and many other applications in mobility, loyalty, order management, LP, supplier management, analytics, and more. Almost a decade ago, Oracle acquired ProfitLogic (a company here in our stomping grounds, near MIT) that specializes in retail profit optimization. They have built on that legacy of science-based optimization and analytics with algorithms for supply chain planning and optimization, merchandising and customer analytics, space planning, and so forth. Brand manufacturers and private label retailers need systems to help them make concepts a reality, managing the development, sourcing, and delivery. Here are two solutions I saw at NRF, addressing that need. 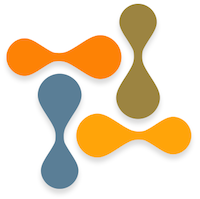 In 2005, PTC acquired FlexPLM, a PLM platform for use by retail, apparel/footwear, and consumer goods firms. This platform enables retailers to plan, design, develop, and source their products. The list of brand owners using the platform is impressive including Nike, Adidas, Marks & Spencer, Liz Claiborne, Patagonia, Timberland, Chico’s, Brooks Sports, and many more. 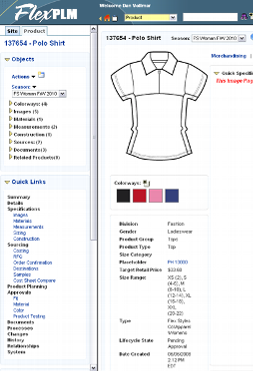 FlexPLM provides the ability to create product specification data, such as BOMs, packaging and labeling, measurements, and design imagery. It also supports the product development process by allowing customers to manage libraries of critical information, such as materials, colors, prints, patterns, and artwork. These packages of information are assembled and used to communicate requirements to suppliers and manage the sampling and prototyping processes. Trusted suppliers may also participate in the design and development process by verifying, updating, and building out product spec and library data, generating their own data and ideas. Vendor management/scorecarding and detailed product/material costing is a leveraged advantage, while retailers can also cost products and materials in FlexPLM without input from suppliers. One of PTC’s differentiators is what they call Value-Ready Deployments (VRD), which provide a collection of best practices that are tied to business drivers and are supported by pre-configured software. These VRDs are deployed along with rapid implementation services (on-premise and cloud-based) to help customers deploy and realize value quickly. CBX Software provides a platform combining PLM with sourcing and procurement, extending from concept through to actual delivery and payment. 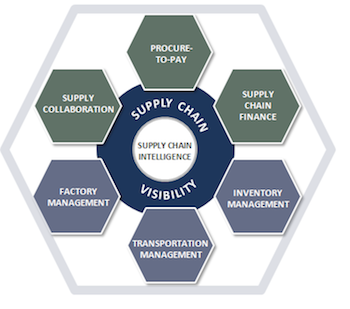 They refer to it as “Total Sourcing Management.” The software has a critical path management tool that is able to orchestrate end-to-end processes across planning, design, sourcing, sample management, commitment and order management, production (WIP tracking), pre-shipment inspection, shipment, and payment. Recognizing that there are multiple ways to specify and source across product categories, the platform supports anything from a simple illustration or written description to a full blown BOM with construction details and a formal RFQ process. Their sweet spot is clients that have substantial amounts of private label or exclusive label products, who value end-to-end process integration. CBX customers include department stores, super/hyper-markets, and a range of specialty retailers and brand manufacturers in sectors such as apparel, furniture/home furnishing, DIY and general merchandise. Retail and manufacturing brands on the CBX platform include: Safeway, Cortefiel, Pepkor, El Corte Ingles, Lamps Plus, Lidl, Berkshire Blanket, Conforama, Kmart/Target Australia, and others. Many of the above platforms, especially the suite vendors, have analytics and/or rules-based engines. Here are two companies for which those are the core of their offerings. 1010data’s core is big data discovery. Their first customer, back in 2000, was the New York Stock Exchange. They have captured data on every single trade that has taken place since then, all 1.6 trillion rows of data, and made it instantly searchable, allowing exploration and analysis. Leveraging that technology, in retail, they create a variety of applications that are flexible such as inventory analytics and fraud detection. They can take just about any kind of structured data, load it in quickly and do analysis. They have gotten good at cleansing and harmonizing data from many sources by serving customers like P&G and Sysco. 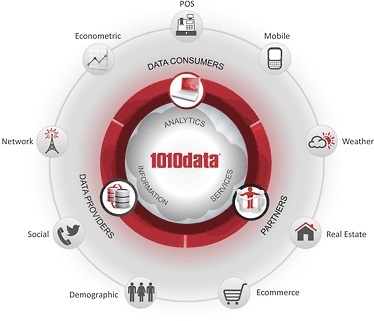 At NRF, 1010data announced their Facts data service, which incorporates over a trillion rows of data from various sources including public data (e.g. Census, BLS, NOAA, all kinds of agencies data); Third Party Data (such as credit bureaus data from Experian, TransUnion, and Equifax, and others); and ‘Disruptive Data,’ which includes consumer spend data from a 5.5 million consumer via an opt-in program. For that consumer spend data, every transaction is automatically captured, rather than relying on self-reporting. With Facts, 1010data has added a large reservoir of data sources to their scalable big data platform. This can be used by retailers to do competitive wallet share analysis, and much more. I met Portugal-based WeDo Technologies. Now there’s a company that is hard to pigeonhole. At the core is a platform that can pull in data from just about any source in near real time and then execute rules to look for all manner of patterns, deviations, trends, anomalies, and help make decisions and send out alerts. They have seen the most success in Telecoms, doing things like inspecting CDRs (Call Data Records) to ensure proper billing, thereby recovering previously lost revenue. They can also do fraud detection and end-to-end operational risk and have customers in energy/oil and gas and healthcare. In retail, they help with loss prevention, as well as monitoring execution. One novel concept they have is a robot that travels down the aisles taking a video of the shelves and then they compare those images against the planogram to measure planogram compliance. They can check compliance to trade agreements between retailers and manufacturers. When something is amiss, alerts can be sent via a variety of methods and a workflow engine closes the loop to ensure someone is responding to the alert and taking action. What I found interesting is these are not after-the-fact reports, but rather near-real-time alerts that enable action to be taken. What they do is a type of continuous real-time situational awareness. Given the extraordinarily broad range of problems WeDo can potentially tackle, it will be interesting to see where they get the most traction in retail. As always, NRF proved that this industry never stands still. We see so much progress year after year. The thorny problems, such as omni-channel fulfillment, are actually being solved. And new waves of developments in the Internet-of-Things, leveraging in-store video, RFID, Bluetooth beacons, and more, are at that early exciting discovery phase, where so many things seem possible, but many things remain to be figured out. We look forward to seeing those answers in future NRF shows.